Okay, so I love all of the weekend adventures I've been going on. I'm not even going to complain about spending over 30 hours in the car in the span of two weekends. This weekend is a short trip to Athens, then next weekend I might not get out of bed once. I might hibernate. Can I catch up on three weekends worth of sleep in two days? Challenge accepted. 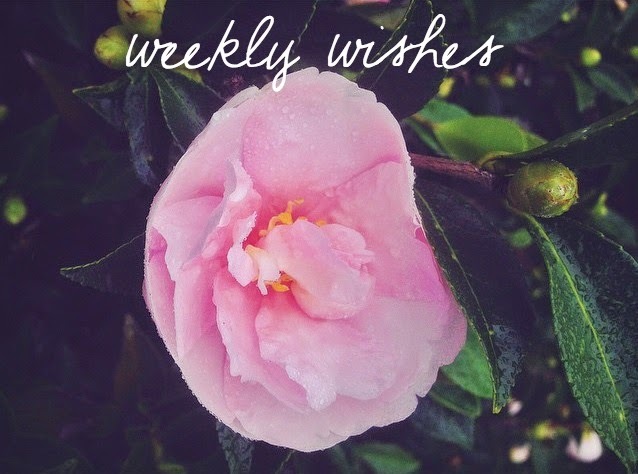 Anyways, since yesterday I did my tour through blogland, we didn't catch up on weekly wishes! that super fun craft project :: okay. this is finished + not finished. every pinterest tutorial saying that hot glue will hold together wine corks is a liar liar pants on fire. I put together my wine cork initial with hot glue, only burned myself twice and pulled my hair into the gun once [seriously, I need constant adult supervision..] but then as soon as it was all dry + cool, I stood it up to take the after picture for the blog, and the loop part of the P fell off. wtf mate. I'm going to try something else to stick them together, then I'll be pinterest famous because I'll have found the perfect wine cork bonding agent! schedule at least four posts :: fail. get it together, self. I did start four different posts, that counts right? minimal dining out :: SUCCESS. Last week I managed to not eat out at all. Actually. That is a lie. I did manage to not eat out using any of my dollars, which was the goal. To celebrate, yesterday I went to Kohl's and spent too much money stocking up on new tights (because all of mine have holes in them. not just runs, holes. I can't have anything nice.) and buying the perfect new gameday dress. clean the apartment :: Auburn weekend means lots of sleepover guests! It's actually pretty clean already, since my roommate had company last weekend. two miles per day towards #100ByChristmas :: I don't want to lose any weight? But I want to stay skinny and maybe build some muscle, but really just make sure I can eat all the Thanksgiving and Christmas dinners and still be able to wear the clothes I already own to Europe. LAST PAYMENT FOR EUROPE EVER:: I will have my whole 9 day trip paid off completely by next Wednesday. HOW cool is that? I've paid for an entire trip to Europe! I'm such a grownup. What are your goals this week? Is ones of them to win $250? You should check out the giveaway Becca put together for her birthday! I've been cleaning the apartment non-stop for like three days now I feel like. Having mother AND father in town this weekend for Auburn means the apartment must be spotless, right? Ugh. exactly! I always feel like I have to have my apartment spotless even if the people who are coming to stay with me know that my entire life is a mess, including my apartment. Blast some of that Taylor Swift as you clean the apartment! Can it be the weekend please? football needs to come back into my life. YAY Europe is paid off, you go you grown up you! oh there will DEFINITELY be some Taylor Swift blaring while I clean! I'm SO ready for this weekend, I wish there was a fast forward button. I don't want to do wednesday-thursday of this week. ALSO I CANNOT COMPREHEND that I've paid off an entire trip to Europe, blows my mind. I agree with Melissa. T-Swift it up and knock out all of the cleaning. Congrats for getting Europe paid off. Don't be surprised when I show up at the airport to hide in your luggage. Mais oui? hahaha I'm sure security wouldn't even notice. should I not make airport security jokes? I don't want to be put on the no-fly list..
ohh two miles a day is an awesome idea. and yay for paying off europe! OK, question: are you gluing the corks TOGETHER or onto something like cardboard or wood? I can't take credit for the two miles a day, I joined the Tone It Up bandwagon, I totally recommend it though!! payment plans are my best friend! I'm gluing them together, I thought about gluing them to a piece of wood, but my mom convinced me they'd be okay on their own. If it had been a letter like L or I or H or something it would have probably been fine, the curvy part of the P is where we had issues.